Walking through a small green space near the center of Western Heights town, Socrates comes across Paul, who is taking his lunch break in the sun, reading an article by the atheist writer Christopher Hitchens. Hitchens strongly argues that religion is the root cause of many of the world’s problems. In his writings and live debates, Hitchens argues that belief in God is irrational. Paul agrees with Hitchens and tries to convince Socrates that because God doesn’t exist, believing in him is crazy. Through the following dialogue, Paul finds that agnosticism is a more rational position than hard atheism. Socrates: Hello Paul, it is nice to see you outside today. Have you escaped the shackles of slavery for the day? Paul: I’m not a slave. I happen to like my job. Socrates: You may like your job, but are you not bound to it, like a slave? Paul: I’m not bound to it. Socrates: So you’re free to come and go as you please? Paul: Don’t pull me into this, Socrates. I’m on my lunch break and I don’t want to waste it with pointless conversation. Socrates: Do you think examining your life is pointless? Oh dear. What does that say about how you view your life? Perhaps you are trapped like a slave, after-all. Well, we can talk about that another time. What are you reading? Paul: An article by Christopher Hitchens. He is absolutely slamming religion and arguing that it is crazy to believe in God. Socrates: What do you think? Is it crazy to believe in God? Paul: You’re not going to tell me you believe in God, are you? Socrates: Not at all. I don’t know whether or not God exists. But since you have been reading Hitchens’ arguments, I am wondering what you think. Is it crazy to believe God exists? Paul: Well, I tend to agree with Hitchens. 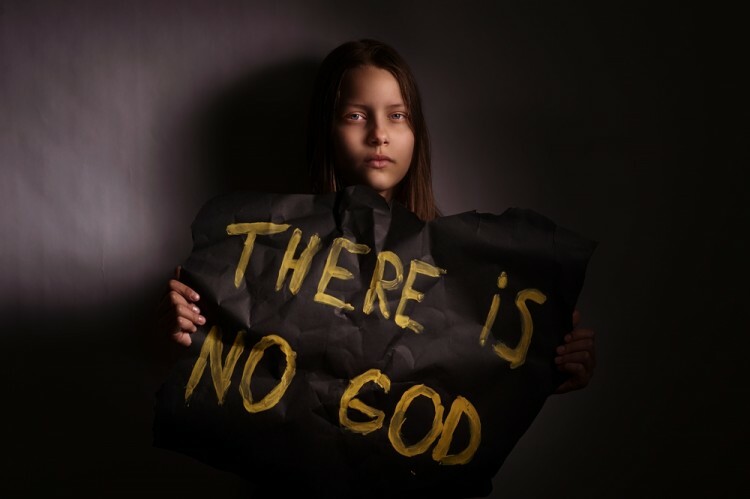 So as far as I’m concerned, God does not exist, and it is irrational to believe in something that doesn’t exist. So yes, I think it is crazy to believe in God. Socrates: God doesn’t exist? That is quite a claim. People across cultures have believed in God for thousands of years, so the discovery that God doesn’t exist is certainly significant. It will undoubtedly change the way we view ourselves and the world. Hitchens must have some compelling arguments. So please tell me, how has he convinced you that God does not exist? Paul: For a start, we know that people invented the idea of God. When we look through history, we see how the idea of God evolved from simpler beginnings. The Christians imported aspects of Egyptian religion into their own belief system, and the Egyptian religion arose from more basic religions. We can trace the notion of “gods” back to the idea that spirits inhabit inanimate objects. Socrates: So, from the fact that humans invented the gods they worship, you conclude that there is no actual God? Paul: That’s right. It’s not that God came down and presented himself to us. It’s more the case that people invented God. Socrates: Did you know that a group of ancient thinkers known as the Atomists invented the idea of atoms? They were convinced that all matter is composed of indivisible parts. Would it have been wise for scientists to conclude that real atoms do not exist simply because the ancients invented the idea of these indivisible components of matter? Paul: Of course not. But there is a difference between atoms and God. We have evidence for the existence of atoms, but there is no evidence whatsoever for the existence of God. No-one has ever seen Him. Socrates: Can you see an atom? Paul: Well, no. But scientists infer their existence by looking at other phenomena. These other phenomena constitute evidence. There is no evidence that leads us to conclude God exists. Socrates: Haven’t many people throughout history claimed to have had an experience of God? There are countless examples of people who have heard God speaking to them? Do these experiences not count as evidence? Paul: I don’t think you’re being serious, Socrates. You know very well that there are other explanations for people’s supposed experience of God. They could be hallucinating. Socrates: You say they “could be hallucinating”. You don’t sound certain. Paul: They could be hallucinating, or someone might be deceiving them. There are many possible explanations for an experience of God. Socrates: I fully agree. There are many possible explanations. And one possible explanation is that God actually talks to some people. Paul: I don’t agree with your last point, Socrates. I don’t think God has talked to anyone. I think the other explanations are far more likely. Socrates: Does the higher likelihood of some explanations entail the impossibility of another explanation? Paul: I suppose not, but we know that when people claim to have had an experience of God there is always a rational explanation. Socrates: In making this statement, Paul, are you not assuming that an explanation leading to the existence of God must be irrational? It seems you have already decided that no explanation pointing to the existence of God would be rational. Paul: I just know that there is always an explanation that doesn’t involve God. Socrates: How do you know? Have you investigated every alleged experience of God? Paul: Are you telling me that you think God actually communicates with some of these people? Socrates: I didn’t say that. I am asking how you know their experience isn’t caused by God. Paul: Well, there is never any independently verifiable evidence to support their claims. Let me ask you this: why don’t we see evidence of God elsewhere? Why is it that the only evidence ever presented is the anecdotal private experiences of a few people? Socrates: How do you know there isn’t evidence elsewhere? Have you looked? Paul: What would I look for? Socrates: You don’t know what to look for? Paul: Nobody knows what God is, so of course I don’t know what to look for. Socrates: If you don’t know what to look for, how can you say with certainty that God doesn’t exist? Paul: Socrates, you seem to be acting deliberately foolish. What I mean to say is that God is non-physical and therefore undetectable by any of our instruments. How can I look for something that is undetectable? Where would I look? Socrates: God may well be undetectable with our technology. Should we conclude from this fact that he does not exist? Paul: Well we certainly don’t have any reason to think he does exist. Socrates: You might not have any reason to think God exists, but as I said earlier, some people claim to have reason to believe he exists. Paul: They’re deluded. Anyone who thinks God speaks to them is either hallucinating, suffering from neurological problems, or just plain mad. There is no independently verifiable evidence for God’s existence. Socrates: I agree that there has never been any independently verifiable evidence presented for God’s existence. Paul: That’s the most sensible thing you’ve said today, Socrates. Socrates: I’m curious though. Are you determined to conclude from the lack of independently verifiable evidence that God does not exist? Socrates: Do you remember the old saying from Carl Sagan: “absence of evidence is not evidence of absence”? Paul: Carl Sagan was an atheist though. He didn’t believe in God. Socrates: You’re quite right. He didn’t believe in God. However, he was a scientist and therefore open to the possibility that new evidence would change his mind. Sagan would, of course, require evidence of the highest quality to support the existence of God. Paul: Do you think such evidence exists? Socrates: I don’t know. There’s no way I can answer that definitively. No-one can. What I do know, however, is that because the universe is so unimaginably large, God, if he exists, could be somewhere you haven’t looked. Therefore, you can’t know that God doesn’t exist. To know that God doesn’t exist would require you to have looked everywhere. In other words, you would have to have knowledge of the entire universe. There is a word for this type of complete knowledge. Socrates: Yes, that’s correct. And no mortal is omniscient. You would need god-like knowledge to be able to claim with certainty that God does not exist. Do you have god-like knowledge? Socrates: So you accept that you do not have complete knowledge of the universe? Paul: I never claimed to have complete knowledge of the universe. Socrates: You made the claim that God does not exist with a level of certainty that implied complete knowledge of the universe. Paul: Well, I admit that there is much we don’t know about the universe. No-one has complete knowledge of the universe. Socrates: Good work, Paul. Making this admission is an important step towards truth. Now, do you agree that if you don’t have complete knowledge of the universe, you cannot know that God does not exist? Paul: Okay, I don’t know that God doesn’t exist. But I still don’t believe he exists. Socrates: Because you have not yet been presented suitable evidence? Socrates: If suitable evidence was presented, you would be willing to change your mind? Socrates: Of course. You should only accept evidence that matches the weight of the existence claim. Carl Sagan also said: “extraordinary claims require extraordinary evidence”. Paul: I still don’t think we could ever find evidence for the existence of a non-physical entity such as God. Socrates: Perhaps this point is something we can explore at another time. For now, I will let you get back to your Hitchens article before your lunch break ends and you have to re-shackle yourself to work.